The auditorium was packed, the air buzzing with anticipation and excitement. Kate Humble, the ambassador for the Whitley Fund for Nature (WFN) and hostess for the evening’s award ceremony—known as the “Green Oscars” in the conservation world—leaned over the microphone onstage and smiled at the crowd. The room fell silent. A beat passed; then thunderous applause sounded, filling the auditorium. Across continents, in San Francisco, California, the WCN staff were equally, effusively, celebrating this prestigious and much deserved honor for Pablo. 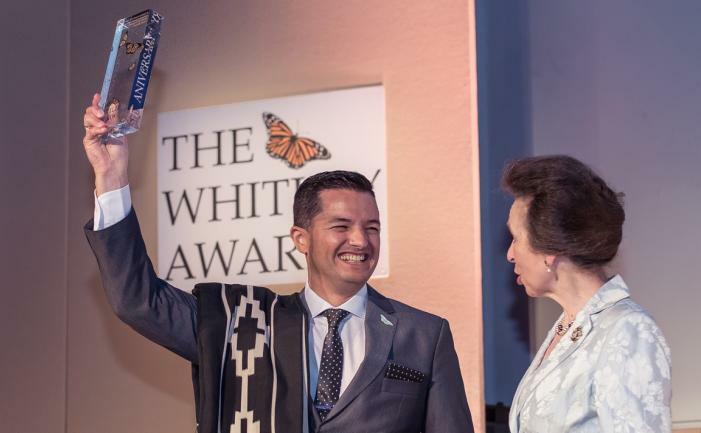 Dressed impeccably, Pablo (or Popi as he is affectionately called) joined Kate at the podium and was then presented with the award by HRH The Princess Royal. Popi is many things: a champion for penguins, a leader in penguin conservation, a WCN Conservation Partner, and a previous Whitley Award winner in 2010 (and a recipient of additional funding in 2012 and 2014). He is charismatic, down to earth, and a true visionary, whose passion for penguins shines brightly. As the founder of the Global Penguin Society he calls safeguarding penguins the “mission of his life” and has been on a campaign to raise awareness about penguins and the many threats that affect them for almost 30 years. Working with the Argentinian government to designate the UNESCO Blue Patagonia Biosphere Reserve. The largest in the country, it covers an area roughly the size of Belgium—more than 3.1 million hectares (12,000 square miles) of marine and coastal habitat—benefitting hundreds of wildlife species, including 20 penguin colonies. Securing the creation of a wildlife reserve and an ecotourism plan that helped increase the population of a Magellanic penguin colony in El Pedral, Patagonia, from six pairs in 2008 to more than 2,000 pairs in less than a decade. These achievements are just a few in the vast ocean of his accomplishments. With the prize money from the award (amounting to $84,000), Popi is determined to go even further to protect all 18 species of penguins across the Southern Hemisphere. We at WCN are honored to be able to support him on this journey however we can. We look forward to celebrating many such shining moments in the future—congratulations, Popi! Read all about Popi’s many accomplishments and his plans for the future on the Whitley Fund for Nature website.